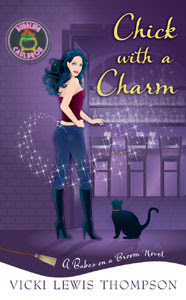 Vicki Lewis Thompson announced a new magical series, Babes with Brooms, which kicks off with Blonde With a Wand (Feb 2, 2010) to be followed by Chick with a Charm (Mar 2, 2010). I am always a sucker for these kinds of titles and I love illustrated covers. How about you? Oh these look cute! I've never read any of her books..although I have a bunch of them on my TBR pile. I'll have to start reading them (along with the other million books there!). I love the covers. I will definitely be checking these out when they're released. 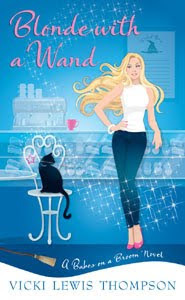 Bella I like lighter paranormals and love illustrated covers too. These look fun. I love Vicki Lewis Thompson and I like everyone else need to move some of her stuff up on my tbr pile...her Nerd series is very fun!